Apparently this is the week for belt tutorials! 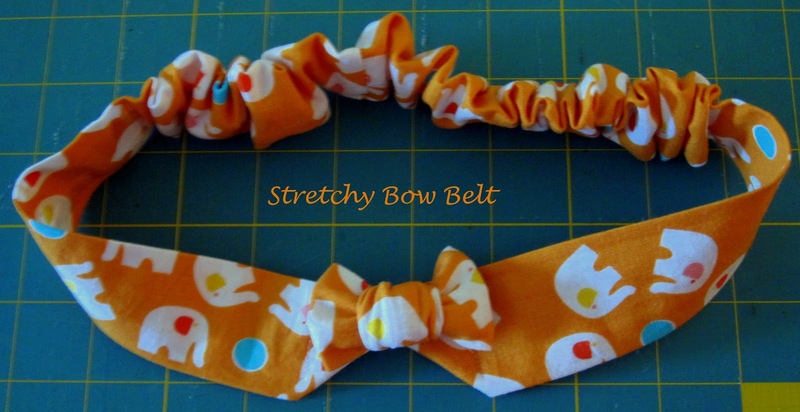 Here is the one I promised I’d post last week for a Stretchy Bow Belt. 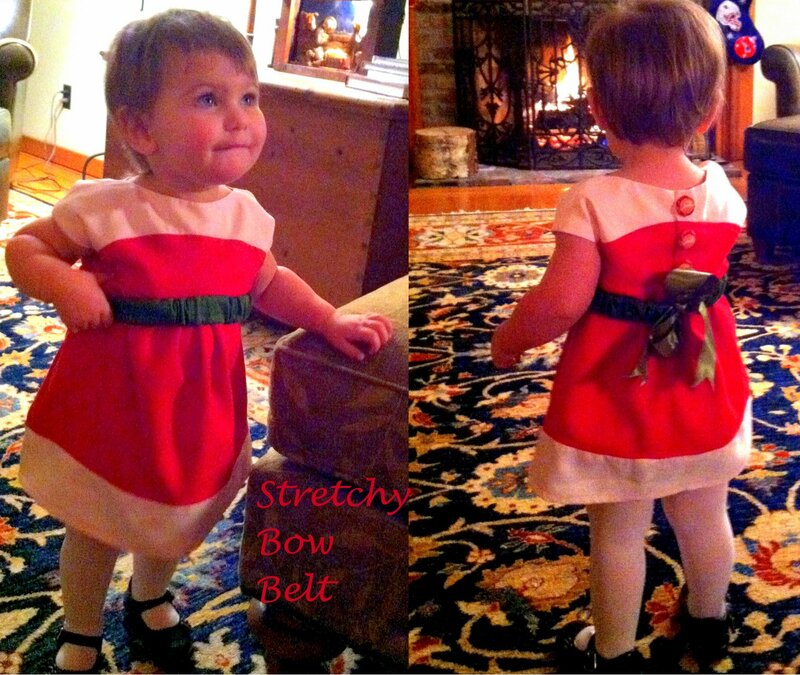 With Bean running around all winter, it was difficult to keep a bow or ribbon tied around her waist. I thought a better option would be a belt with some stretch that snapped in place, since she has a harder time undoing a snap. Of course I added a bow to make it even cuter, hehe. It’s pretty easy to adapt this belt to fit your child, but the following measurements worked well for Bean all season at about an 18 month old fit. 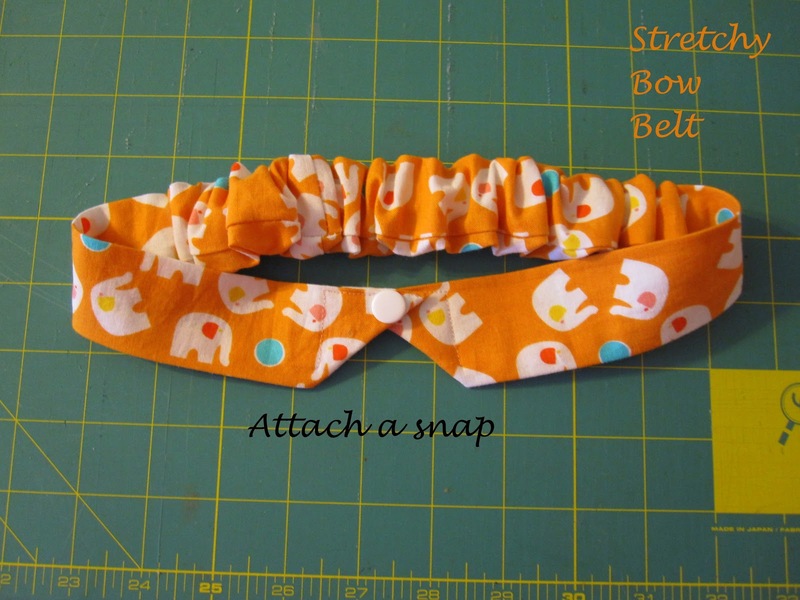 You’ll need 8.5 inches of half inch elastic and 42 inches of 4 inch wide fabric cut into the following dimensions: 4″ x 33″ to form the belt; 4″ x 6.5″ to form the bow; 4″ x 2.5″ to form the center of the bow. 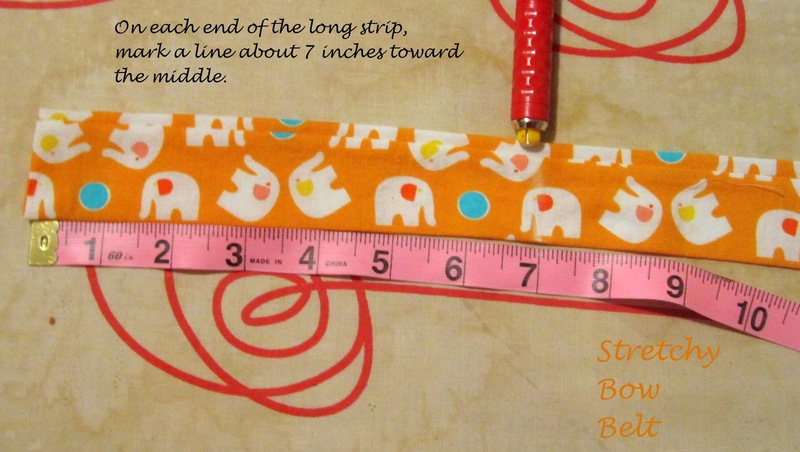 Fold each 4″ piece in half right sides together (it will be 2″) and stitch along the long side, leaving the ends open. Turn right side out and press (in the supplies photo above this step has already been completed). 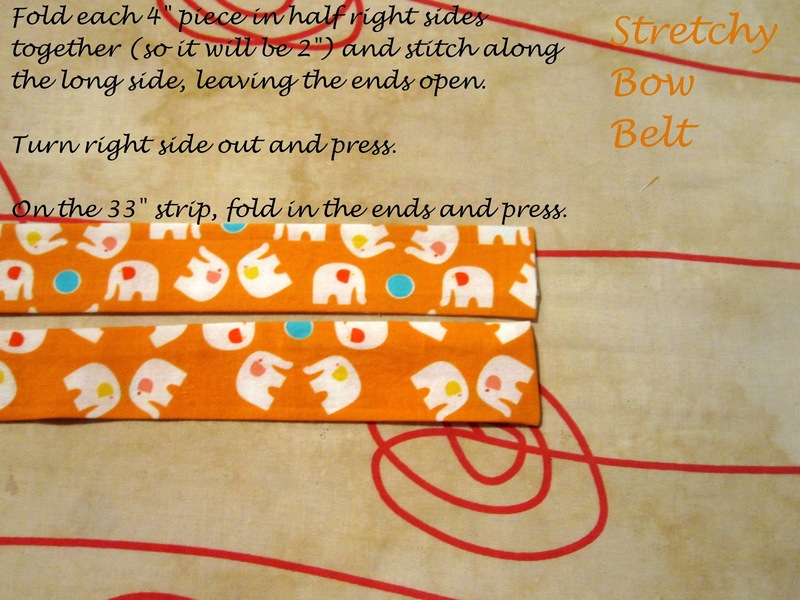 Fold in the ends of just the 33″ long strip and press – do not sew closed. On each end of the long strip mark a line about 7 inches toward the middle. 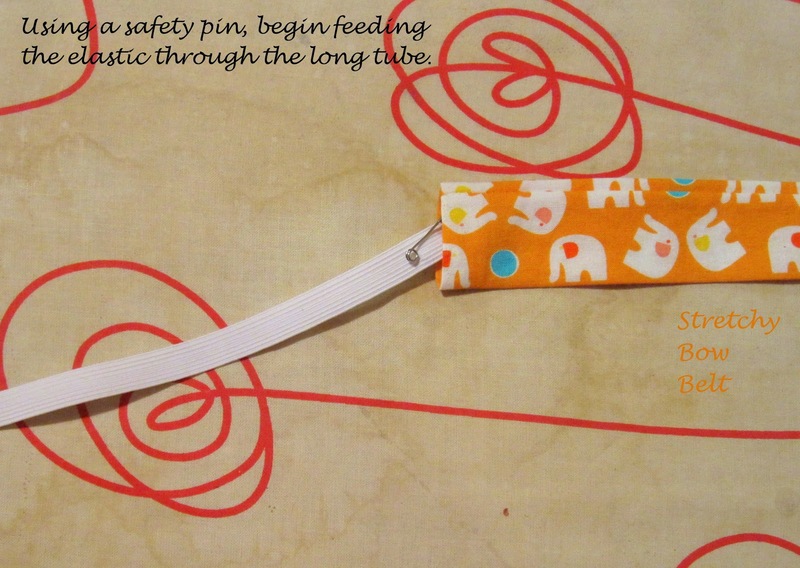 Using a safety pin, begin feeding the elastic through the long tube. Continue feeding the elastic until the end without the safety pin reaches the first marked line. 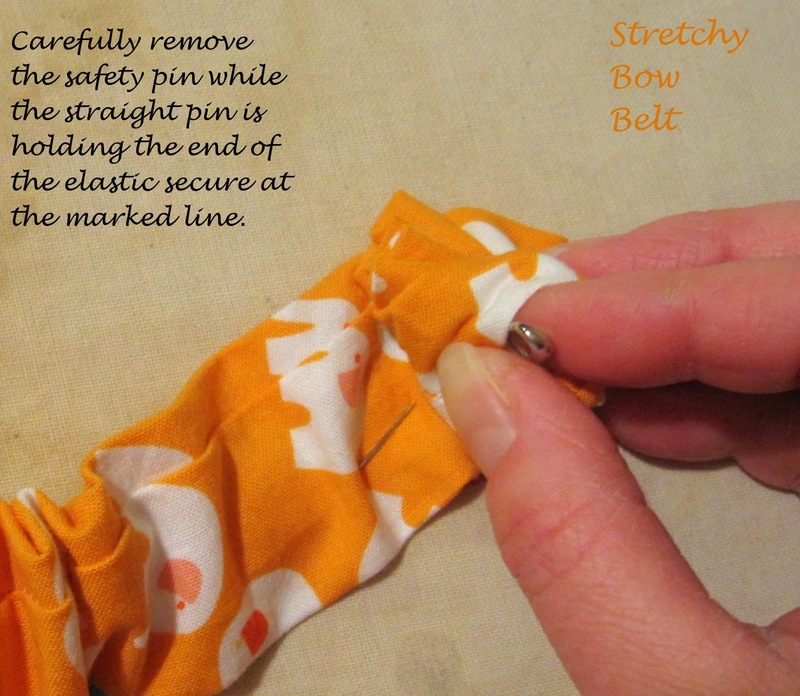 Hold that end of the elastic in place with a pin. Stitch a line through all the layers at the marked line including the end of the elastic where the straight pin was holding it in place. Continue feeding the end with the safety pin through the tube (forming some ruffles) until it just passes by the other marked line (about 7 inches away from the end). Hold the end of the elastic in place at the marked line with a straight pin, making sure that the safety pin is free and can be removed from the open end of the tube. 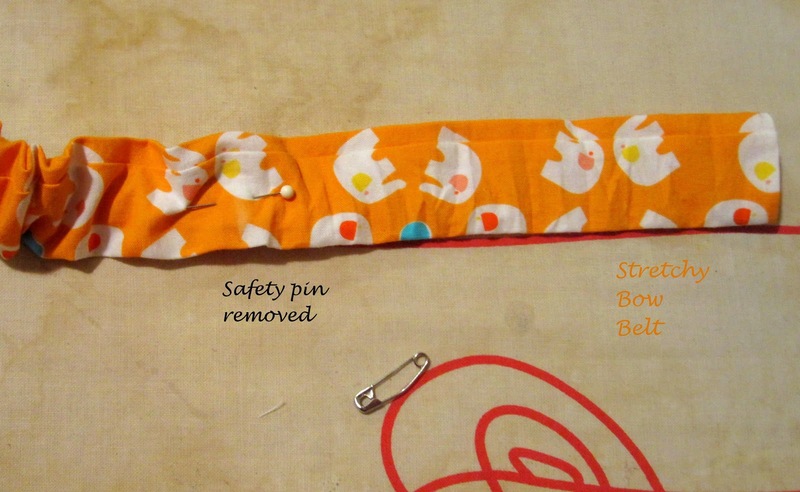 Carefully remove the safety pin from the open end while the straight pin is holding the elastic securely in place. 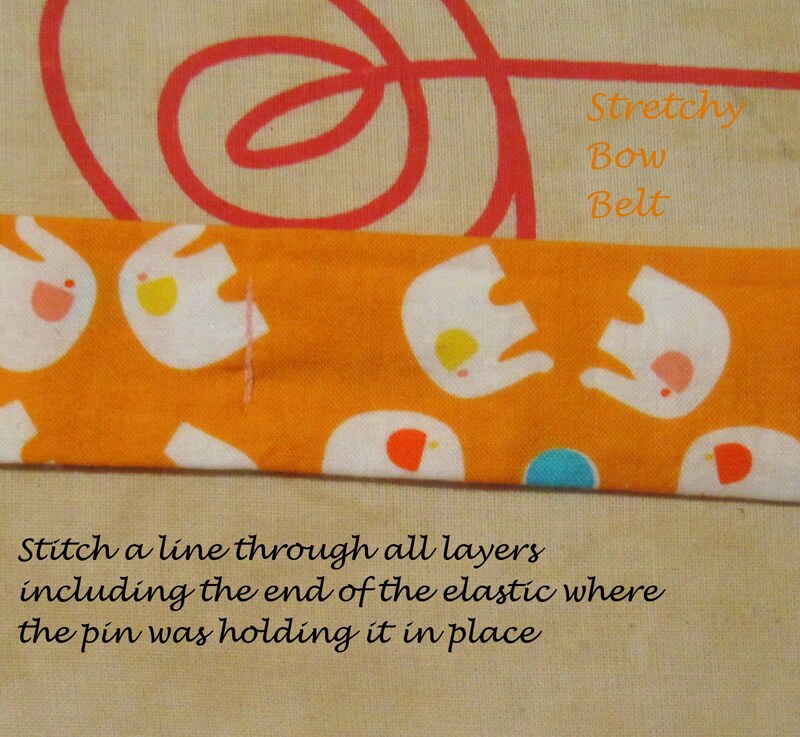 Stitch a line through all layers at the marked line where the straight pin is holding the elastic in place. Then top stitch each end of the tube along the pressed edges, closing the tube. Attach a snap to hold the belt ends together. Depending on the size of the bow I am using, I like to fold under and stitch down an angle at the end of each side to showcase the bow. If you make a larger bow this isn’t necessary. It should also be mentioned that you could just use the belt as is with a snap and it’d still be super cute. If you’d like to make the bow here are some simple steps. I didn’t get many pictures of this step, but it’s something like this. 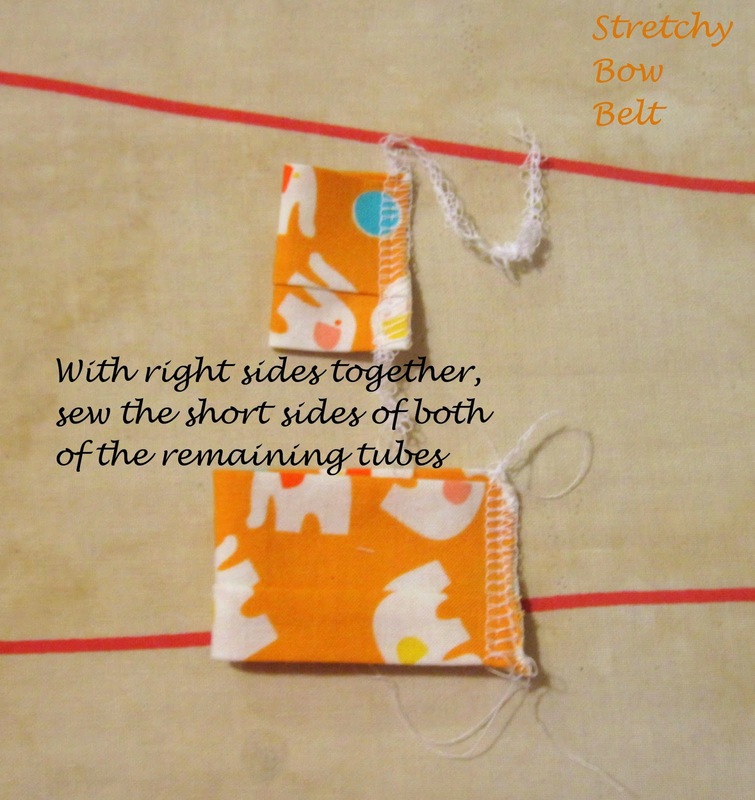 With right sides together sew the short ends of both of the remaining tubes (remember we already sewed together the long ends in the first step). 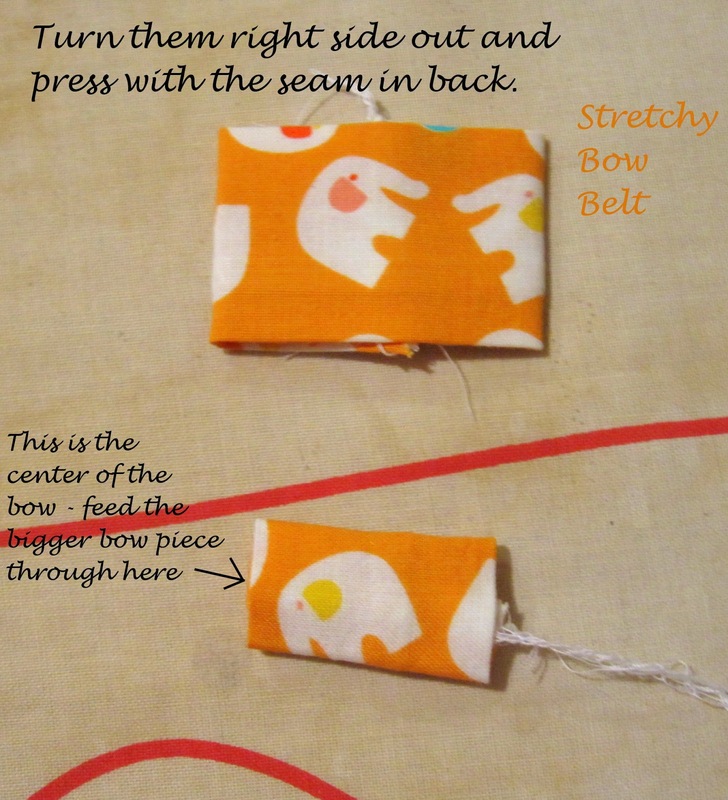 Turn them both right side out and press with the seams in the back. Then take the bigger bow piece and feed it through the smaller tube which will become the center of the bow. Then hand sew the center tube to the bow cinching it toward the middle and fluffing out the ends of the bigger piece to resemble a bow. 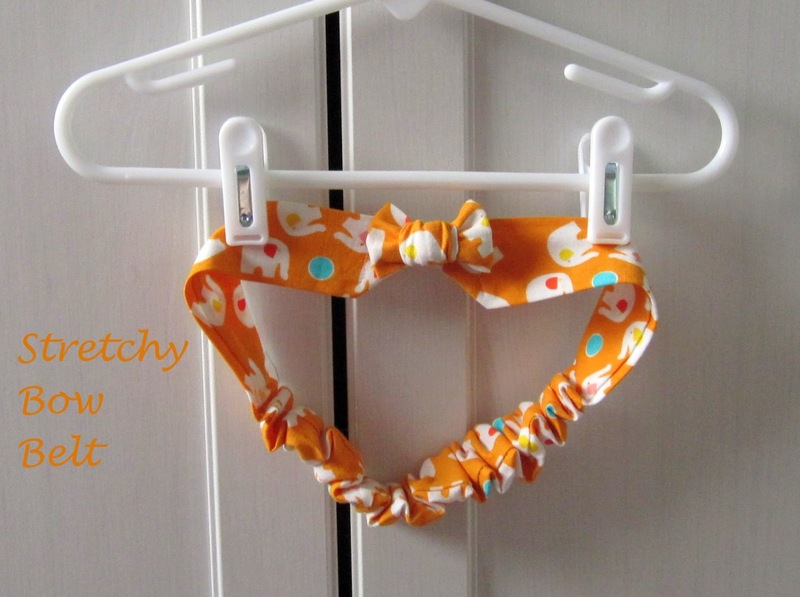 Hand stitch the bow to the end of the belt over the snap and the belt is complete! In these pictures, Bean is wearing a Go To Shift Dress (affiliate link) that I made in November in size 18 months. It’s now a little top, hehe. I love the little keyhole detail in the back. I’ve made several versions of this belt and I love them all. 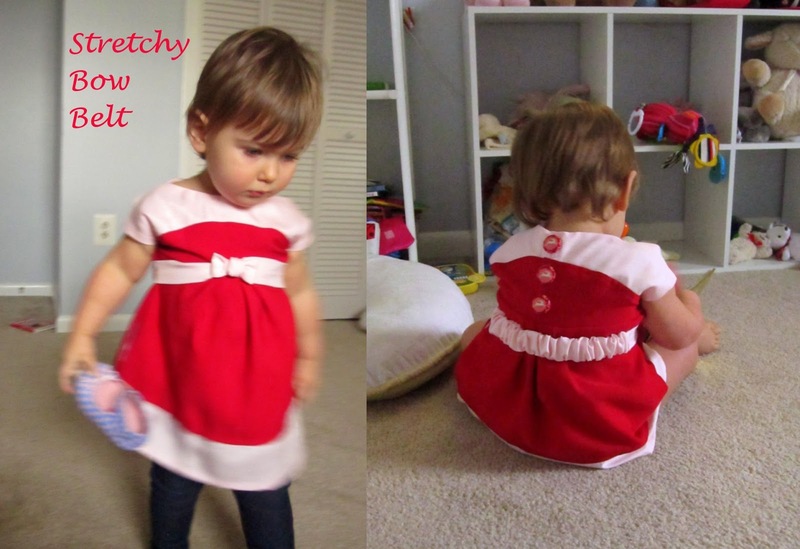 I made Bean a Maggie Mae Dress (affiliate link) in red and pink to use both for Christmas and for Valentine’s day. We just used a green belt on Christmas and a pink belt (and jeggings since she’d grown too tall for it to be worn as a dress) on Valentine’s day. 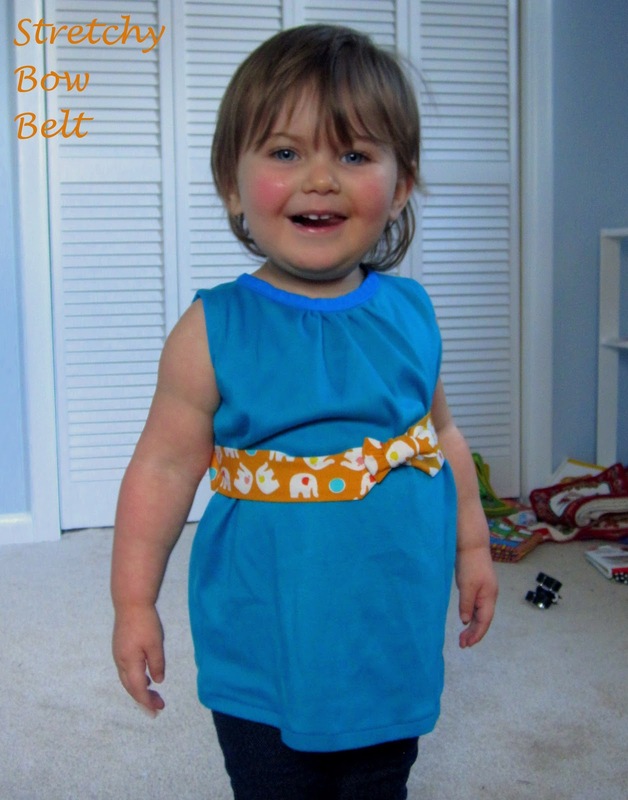 The green belt is slightly different – instead of a snap closure I sewed ribbons onto each end and tied it in the back. It still has the elastic and ruffles, however. There are so many possibilities with this type of belt! 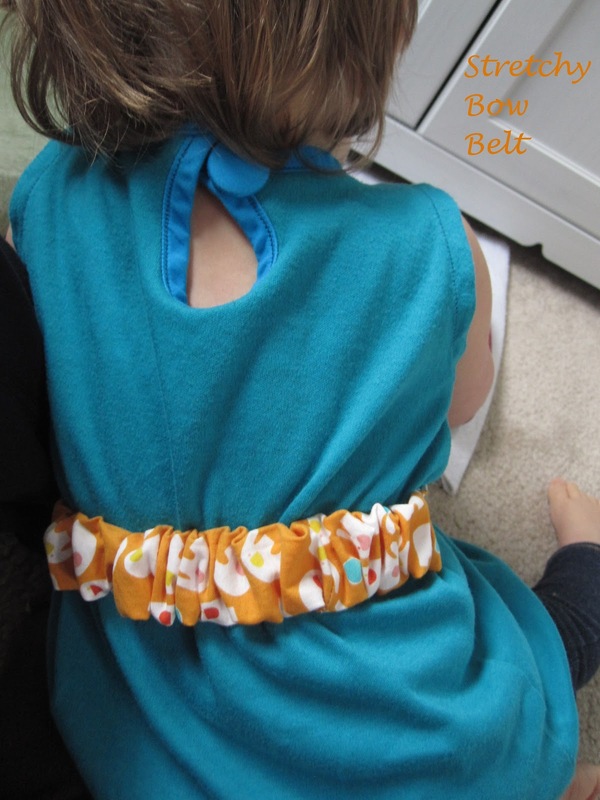 Who would have thought about a belt for a toddler, but it works! I think you have designed the perfect accessory! I'm jealous your toddler will wear a belt! Great accessory. I think it's funny that you put so much effort into belts for bean. I can't stand to wear a belt. EVER. 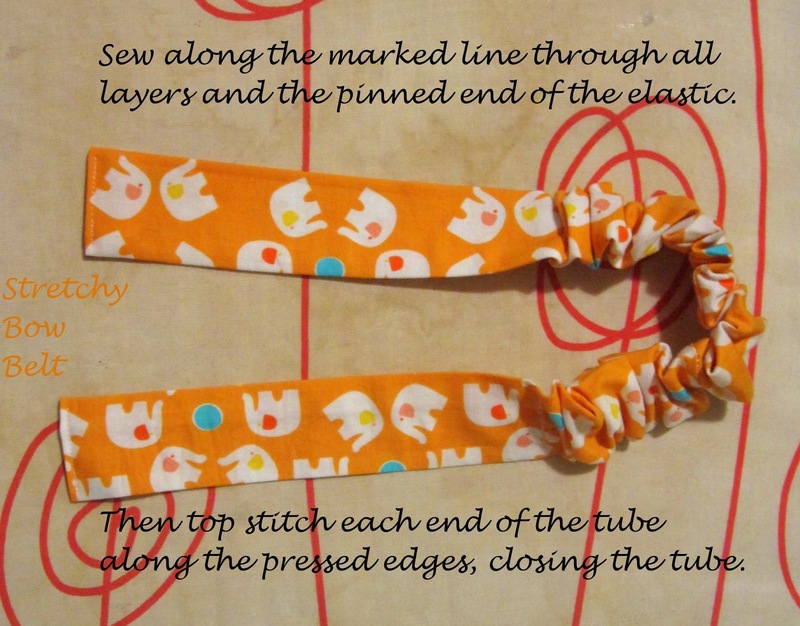 And, I suppose if you made it shorter, this is exactly how you could make cute, stretchy headbands. I dont' wear those ever, either! !